East Germany’s Socialist Unity Party aimed to placate a public well aware of the higher standards of living enjoyed elsewhere by encouraging them to participate in outdoor activities and take vacations in the countryside. 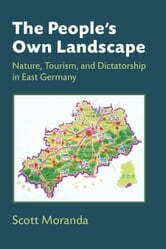 Scott Moranda considers East Germany’s rural landscapes from the perspective of both technical experts (landscape architects, biologists, and physicians) who hoped to dictate how vacationers interacted with nature, and the vacationers themselves, whose outdoor experience shaped their understanding of environmental change. As authorities eliminated traditional tourist and nature conservation organizations, dissident conservationists demanded better protection of natural spaces. At the same time, many East Germans shared their government’s expectations for economic development that had real consequences for the land. By the 1980s, environmentalists saw themselves as outsiders struggling against the state and a public that had embraced mainstream ideas about limitless economic growth and material pleasures.